When first hearing this statement, I thought it was a little lofty at best. Changing an already established game that everyone knows never really works out well (case and point: The XFL). Upon looking a little deeper, however, my opinion quickly changed. The game was a huge success! It really gave new life to beer pong, freshening up the game and bringing back the lost excitement which once surrounded it. People couldn't wait to get their turn at playing with the new cards and really seemed to be enjoying the gameplay. The cards were in fact waterproof as promised and with a few wipes on your pants leg, were good as new. The carrying case provided a great safe haven for cards not being used, keeping them from being blow away and getting lost. The main reason I think people seemed to be really enjoying playing with the cards because it gave a new element of surprise to the game. Everyone knows what you do once you sink a cup, but no one knows what that card is going to say before you flip it over! I am not a fan of the “Next Turn Bounce Shot” card. This card makes the flip-ee bounce the ball on the table their next time up. I don't like this card because most house rules are if you bounce a ball into a cup it counts for two cups instead of one. This is usually counter acted by allowing opponents to swat or grab any ball once it's bounced. So, if someone is forced to bounce the ball their next turn, then the other team is already going to know. To combat this I just took out the two Bounce Cards and left them in the container. Overall, I, as well as all those who played with the Pong Deck cards, really loved it. A lot of times when people try to improve on an already existing popular game, it ends up making it worse, but these guys really hit it dead on. 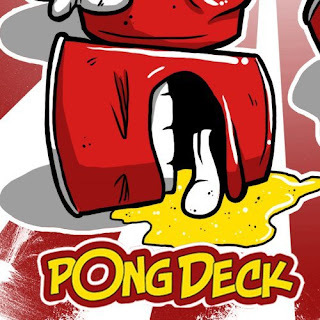 I definitely recommend that if Beer Pong has started to get a little stale, head on over to PongDeck.com and get decked.